Reading Ursula K. Le Guin’s The Left Hand of Darkness without a good lexicon is driving me stark raving bonkers. I’m starting one here, in the hopes that it will be helpful to other readers. Some of my sources include Rebecca Rass’s short glossary, Joanna Kieschnick’s LHD vocabulary, and another one from Lowell High School in San Francisco. ansible: a communication device of the Ekumen that does not involve radio waves or any form of energy. It produces a message at any two points simultaneously, anywhere. bespeaking: speaking to someone else using telepathy (Ekumen). bessa: soft, unpacked wild snow. breadapple: A staple food in the Gethenian diet. Celibate: One of the nine participants in a Foretelling; sworn to take no mate during kemmer (sexual potency). There a five Celibates in a Foretelling and one must be in kemmer. Chabe stove: a small stove with a potent, condensed power source. child of the flesh: offspring that one has physically given birth to. Commensals: Thirty-three heads of the Orgota government. commensality: regions of Great Commensality of Orgoreyn. dothe: A short period of supreme energy and strength, “hysterical strength,” entered by Gethenians at will. Educer: teacher of mindspeech (Ekumen). Ekumen: League of the Planets: 3000 nations on 83 planets. The Ekumen’s purpose is to develop communication, trade, and harmony between planets. Erhenrang: The capital of Karhide, one of the two states on the planet of Gethen. farfetching: Ekumen discipline of “intuitive perception of a moral entirety”. Fastness: A religious retreat of the Handdara cult, and its only fixed locale. People can stay there a day or a lifetime. foray gun: Ranged weapon that fires metal projectiles. Foretellers: Masters of prediction in the Handdara Cult. Gethen: A distant planet where the story’s action takes place. It is also called Winter, because of its bitterly cold climate. gichy-michy: high-energy, low-density condensed foodstuff. Handdara: The mythical cult or religion of the state of Karhide (modeled by the author on Chinese Taoism). One of its principles is the coexistence of opposites. Handdarata: Practitioner or devotee of Handdara. Hearth: unit of family affiliation; clan; lineage; extended family; large clan house. hemmens: The most prevalent tree on Winter, a conifer with thick, pale scarlet needles. Hes-kyorremy: Inner Council of the kyorremy (Karhide). ignorance: In the Handdara sense: a positive state of mind. It means ignoring the abstraction and holding fast to the thing itself. Karhide: A state on Gethen, governed by King Argaven. karhidish: of, or pertaining to, Karhide. kemmer: A short, cyclical period of sexual activity (estrus). Kemmerhouse: A place in every community open to everyone, where people in “kemmer” – sexual heat — can find available partners. kemmering group: A group of people who regularly meet in their “kemmer” phase. kemmering vow: Bonding for life, a personal commitment between two people. kroxet: windless weather between 0 and 20 F.
kurem: damp weather between 0 and -20 F.
kyorremy: the upper chamber or parliament, which Estraven used to head (prime minister). Now held by Tibe. Meshe: founder of the Yomesh religion. mindspeech: Ekumen discipline of mental communication, telepathy. Mishnory: The capital of Orgoreyn, one of the two states on Gethen. NAFAL ship: Nearly As Fast As Light ship of the Ekumen. neserem: fine snowfall with a moderate gale; light blizzard. nusuth: No matter. It really means inactivity or noninterference, and serves as a typical Handdara response to many situations. Open Trade Faction: faction of Orgota government that wants to end the embargo on trade with Karhide. Orgoreyn: A totalitarian state on Gethen. Orgota: of, or pertaining to, Orgoreyn. orgrevy: A shrub; from its resin are derived mind-altering and mood-control addictive drugs. Otherhord: main temple of Foretellers, located in Karhide. peditia: A thick, wet snowfall (Orgota). See also sove-snow. Perunter: A nation on Gethen, reputed for backwardness. Pervert: Permanently displaying sexual characteristics; also one of the nine participants in a Foretelling. pesthry: an oviparous, vegetarian animal which breeds abundantly, trapped for its white or grey fur and occasionally for meat. Sarf: Orgoreyn secret police and its associated bureaucratic apparatus. sastrugi: snow drifts heaped up in long wind-waves. shifgrethor: Pride relationships between individuals. It is the ability to maintain harmony in any relationship and dictates the way Gethenians relate to each other, especially in Karhide. See also here. Sith: A nation on Gethen. somer: sexually inactive part of the kemmer cycle. sove-snow: A thick, wet snowfall, between 15 and 20 F (Karhidish). See also peditia. Stabiles: the individual planets within the Ekumen. sube-eggs: another staple of Gethenian diet. thangen sleep: the period of fatigue and weakness following the use of dothe strength. thore: a gnarled scrubby conifer ten or twelve feet high, gray-needled, farmed and used for lumber; plastic is made from the resin extracted from its needles. untrance: The Handdara discipline of Presence. A kind of trance involving self-loss through extreme sensual awareness. Weaver: One of the nine participants in a Foretelling, its focal point. Year One: The current year in the Gethenian calendar. Yomesh: The official religion of Orgoreyn. Its followers prefer light and condemn darkness. Zany: One of the participants in a Foretelling, afflicted with schizophrenia; there are always two in a Foretelling. 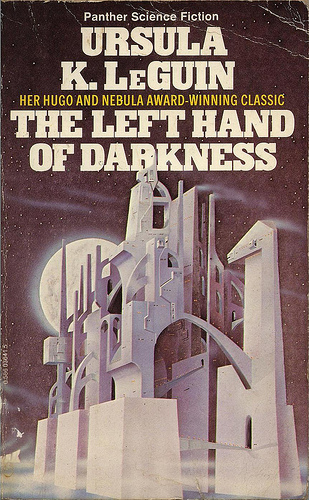 Posted on March 29, 2013 July 27, 2013 by mechanteanemonePosted in books, fiction, learningTagged books, classes, fantasy, fiction, learning, resources, scifi, ursula leguin. THANK YOU!!! This was so helpful, much appreciated.